Lasithi Hotels - choose your retreat by the location on the map below. This is the budget symbol. Lasithi Hotels - sitting in the Dikti Mountains in the Selakano Forest, this quiet mountain retreat is perfect for getting close to nature in comfort. 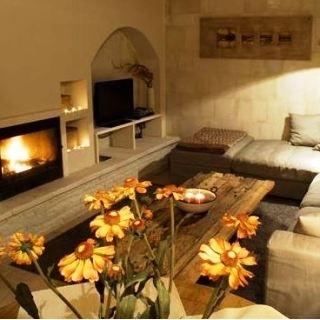 The Pezoulia Mountain Cottages are built of traditional materials - it is as though they are hewn out of the mountain side itself. Rough stones and thick wood, thick walls and solid foundations. 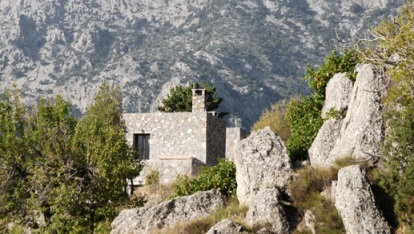 These impressive mountain dwellings are complete with the character of Crete. These mountains and forest tracks are great for trekking, walking, climbing and bird watching. The vegetation is a mix of oaks, maples and plane trees, with the principal tree being pine pinus brutia. Set in the village of Selekano just 30 km from Ierapetra, Lasithi. 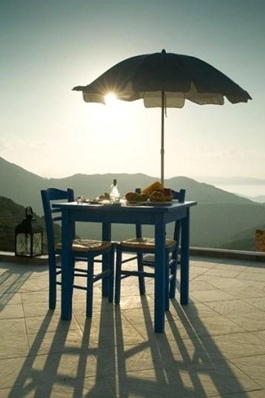 Lasithi Hotels - this is a village with an eagle's eye view from the mountains to the sea in eastern Crete. 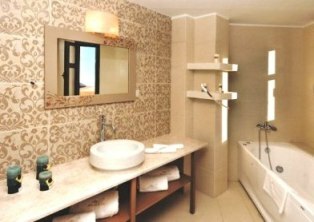 Sitting inland yet only 6 km from the beach at Mochlos, this hotel will give you the flavour of Crete in bucket loads. Sfaka village sits just 40 km from Agios Nikolaos and 30 km from Sitia in the rich agricultural lands of eastern Crete. 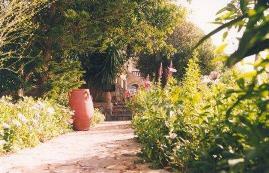 The village consists of 15 restored houses in the traditional Cretan village style. This is a wonderful experience of a crumbling village enlivened and brought back to life with imagination, perseverance and hard work. This is a village to be proud of and to learn about the Cretan people and their tough character and persistence. The suites, rooms, studios and houses have been restored with such style and attention to detail, this is a unique creation, and has been highly commended in the European Residential Property Awards for Best Redevelopment Renovation Greece. Pampering does not stop in your suite, there is a luxurious spa with jacuzzi, hammam and sauna, and endless relaxation packages. 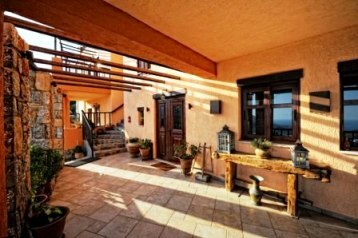 Experience the village life in Crete, with modern luxuries for comfort, in such a scenic location in Lasithi. Lasithi Hotels - this is a hotel with a difference. Really it is a little village where the friendliness and service is wonderful and the houses have been designed and furnished with complete modern luxury in mind, yet still maintaining their traditional essence. High up in the foothills of the Dikti Mountains, over looking the sea, nestled into a hillside, this luxurious retreat with its own character, providing an extraordinary experience of the Cretan lifestyle. Featuring 3 suites and 2 maisonettes, the little village within a village has its own restaurant and cafe, both with beautiful mountain and sea views. Each of the residences has its own private access and each one boasts a blissful, inspiring view from its private balcony or veranda. With room for 4-5 guests in each residence, these spacious rooms are furnished with modern luxurious style and many comforts over and above the average hotel room. You will really be spoilt at Villa Mala. The Villa Mala sits in the beautiful Cretan mountains 40 km from Agios Nikoloas and 14 km from the seaside village of Mirtos and the lovely south coast beaches of Crete. 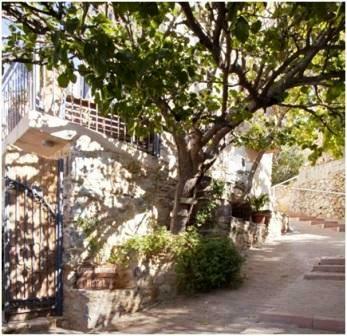 Located in the charming village of Palekastro are the apartments House Margot. Perfectly positioned in far eastern Crete to explore numerous historic sites and beaches, this is a simple family-run pension with good Cretan hospitality. Palekastro is a traditional Cretan village located just 2 km from the lovely beaches of Kouremenos and Chiona, 20 km from Sitia and 90 km from the capital Agios Nikolaos. 6 km from the village is the beautiful and famous Vai Palm Forest and Beach, a paradise on the tip of Crete’s eastern coast. Close by is the spectacular Zakros Gorge and one of the prettiest beaches in Crete; Kato Zakros. The Papadakis family have kept their apartments small, there are two only, with capacity for 6 and 8, surrounded by lovely gardens. The family provide personal care and beautiful tasty local food, made from their own produce. Lasithi Hotels - Eastern Crete - this map shows rural accommodation in Crete.